Publication details: Book. 2007. vii and 115 pages. Publication date: 2007-07-09. with 27 figures, of which 9 in full color. Hardbound. A5 (5.8x8.3 in). The objective of this book is to offer the general ophthalmologists a clinical comprehensive and practical guidance manual for primary angle-closure and primary angle-closure glaucoma to be used in the daily clinical work. Already in the nineteen seventies our Danish colleague, Poul Helge Alsbirk documented the exceptional high prevalence of angle-closure glaucoma among the Eskimo or Inuit population in Greenland, a North-Atlantic part of Denmark. As Danish ophthalmologists ever since have been responsible for the diagnostics and therapy of primary angle-closure (PAC) and primary angle closure glaucoma (PACG) among these patients, this has led to a profound clinical experience and a growing knowledge of the complicated nature of this entity. We have experienced that the sub-clinical asymptomatic, "creeping" angle closure is a common type and early detection and prevention therefore necessary, just as in open-angle glaucoma. Further that different mechanisms and stages of PAC need different treatments and that a new, more differentiated and objectively based classification and terminology consequently has to be developed. To practice these recommendations we have learnt to use a number of standardised, clinical diagnostic methods. To support the Danish ophthalmologists a guidance manual for primary angle-closure in Danish was published 2003 based on our long clinical experience, the present evidence based literature and conferences on glaucoma. As the guidelines in Danish were very well received we were encouraged to produce an updated English edition. 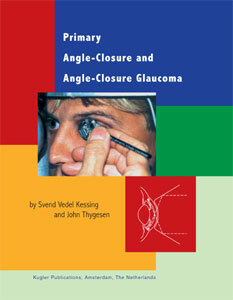 The new evidence about the high prevalence of angle-closure in Asians further supports an English edition. The point that early angle-closure may be cured and the fact that the world-wide visual disability from this disease is almost equivalent to open-angle glaucoma emphasizes the "urgent need" of improving the angle-closure management. The word "glaucoma" is now only used in the presence of structural defects of the optic nerve head or when visual field defects are found. Acknowledgment should be given to our Danish colleagues Poul Helge Alsbirk, Erik Krogh and Lisbeth Serup for their advice and guidance of crucial importance. A special thank goes to Pfizer Denmark, who published the first edition in Danish and sponsored the translation from Danish into English with an unrestricted educational grant.